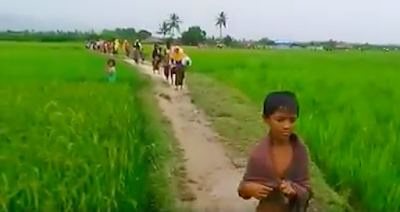 Maungdaw, Arakan – Internally displaced people in Kyet Yoe Pyin village tract in Northern Maungdaw Towship are facing difficulties for medical treatment, food and Shelters. In Kyet Yoe Pyin village tract includes 5 affected hamlets, Ywa Gyi hamlet, West hamlet, Lu Tin Farang hamlet and Fawr Zar Gar Fara hamlet. The population is 4994 Males and 5016 Females for a total of 10010 people that dwelled in a total 1368 houses. According to locals, 803 houses from Kyet Yoe Yin village tract were burnt to ashes by the Myanmar military on October 12th and October 13th. Two third of the market was burnt down there too. All cattle, goats and chickens were loaded on trucks and taken away. The villagers fled from the village when the military started torching the houses and shooting people. They couldn’t take any personal belongings with them. They are now taking refuge in nearby villages. Since the time they fled, 37 women gave birth without any medical treatment and there were no medicines available. All the villagers are facing a lot of difficulties for food and shelter. “The military torched our houses in the pretext of a clearance operation. They looted our properties and destroyed. They are also raiding the houses in other villages and looting gold, cash and valuable things.” a villager told RB News. Report contributed by Rohingya Eye.